Does my dog know when I'm scared? Imagine you're taking a stroll through a local park. As you turn a corner, you see a dog unaccompanied by his owner. If you have a phobia of dogs, you've got two problems: your own fear and the dog's sense of your fear. You might be feeling overwhelmed, anxious and inclined to run away in a panic. The dog, picking up on your fear, and knowing that he is intimidating you, begins to act aggressively. But is there really anything to worry about if you're not doing anything to threaten the dog? Do dogs have any sense of human emotions? In particular, can they tell when we are scared? Dogs indeed can smell fear. 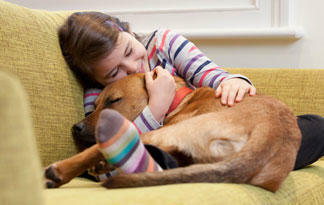 When we humans are experiencing stress or fear, we give off a distinct odor that dogs can smell. When you're nervous, adrenaline pumps through your veins and dogs can smell this hormone. Although these smells are undetectable to human noses, dogs' ultra-sensitive snouts can pick them up. While human noses have 6 million receptor sites, a dog's nose can have up to 200 to 300 million. Dogs also can sense fear by reading your body language. If you talk loudly because you're nervous, stare, tense up or make a jerking body motion, a dog may perceive all these as signs of threat. Your own dog may respond differently to your fear than a canine you have never before encountered. For example, your dog might not act aggressively towards you if he senses that you're scared; however, an unfamiliar dog might be more skittish if he picks up on your fear. In addition to fear, dogs can pick up on the more simple human emotions such as happiness and sadness. However, because dogs lack the self-awareness and complex consciousness of humans, some researchers argue that they can't understand or experience comparative emotions such as jealousy or empathy. Other researchers believe that dogs do have simple sets of emotions and can read more complex comparative human emotions. A study by Friederike Range and her colleagues at the University of Vienna and Paul Morris of the University of Portsmouth in England found that dogs experience emotions such as pride and jealousy. Dogs were placed in pairs and given commands to put their paws in the experimenter's hand. One dog in the pair got a treat when he obeyed, the other did not. After some trials, the unrewarded dog stopped performing the trick or took longer to do it, suggesting envy. However, behaviors may not always be related to understanding emotions. A dog who just has chewed up a new pair of shoes might look guilty or hang his head low when you discover the mess. He could behave this way because he's anticipating the punishment to come because of their actions rather than actually understanding of human emotions. So, if a dog really understands emotions, is he simply reading the emotions as a sign of human weakness and acting accordingly? For example, if your dog senses that you're feeling sad or scared, when he comes to cuddle with you, is he really trying to comfort you, or is he taking advantage of your unhappiness to get a belly rub? Man's best friend is keeping this one a secret.